BRIGHTON, Mich. - 150 years after his birth, July 30th marks what would be Henry Ford's 150th birthday. Born in Dearborn on July 30, 1863, he built his first car in 1896 and founded Ford Motor Company seven years later. To remember this great men and all that he accomplished, here are 5 things you might not know about Henry Ford. 1. Henry Ford and Thomas Edison were great friends! Before Henry Ford become the automobile man that he's known for, he worked for Thomas Edison at the Edison Illuminating Company from 1891 to 1898. They become longtime friends and would frequently vacation together - sometimes President Warren G. Harding would tag along. 2. 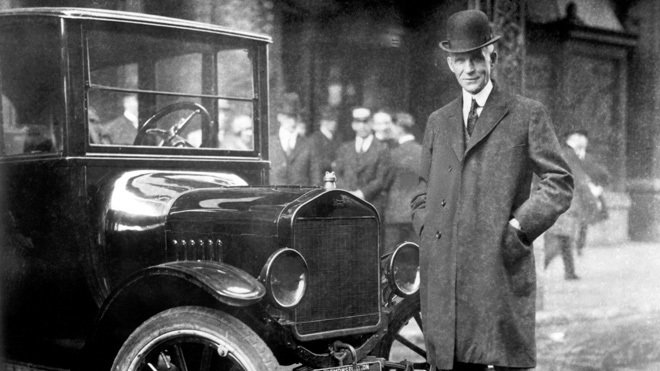 Ford Motor Company wasn't his first car company, but actually his third! The first was the Detroit Automobile Company, the second the Henry Ford Company, and then finally the Ford Motor Company that survives today. The other two companies were dissolved because of Henry Ford's dissatisfaction with the high prices and low quality of the cars being made. 3. Henry Ford built an entire town named Fordlandia. This town exists in the middle of the Amazon and was built on the idea that it would be a self-reliant town that could produce the rubber for the tires on Ford vehicles. It ended up failing and the town stands empty and abandoned to this day. 4. He ran for U.S. Senate and almost won! He ran as a Democrat for a Senate seat in Michigan, but only because of the insistent pleas of President Woodrow Wilson. Ford refused to spend a penny on the election and still only lost by 4,500 votes out of 40,000. 5. Ford was awarded 161 unique patents! Some of the patents include ethanol as a fuel source, charcoal briquettes made of scrap wood, and the development of alternative plastics made from soybeans. Henry Ford's history is well known throughout the world, however, we hope you enjoyed these 5 things you might now know about Henry Ford. The maker of many great vehicles, we'd love for you to stop by our Wixom Area Ford Dealer today and check out his legacy. We have a great selection of New Ford Trucks and Certified Preowned Cars For Sale. So stop by and see us today! Brighton Ford is located at 8240 Grand River Ave. just north of I-96 in Brighton. We are a family owned and operated business that strives for customer satisfaction. For more information on Brighton Ford visit BrightonFord.com or give us a call at (800) 836-8206.